Farmer networks can vary from relatively informal discussions groups, to more highly organised, farmer driven initiatives, such as farming systems groups. What they all have in common, is that they are self directed and farmer needs driven. Personal professional networks, are those an agricultural professional actively builds, to help source the information, knowledge and develop the skills required to carry out their role. Some of these networks will be provided as part of their workplace; but importantly every professional needs to seek out and build their own network of peers, farmers and mentors; that can help them grow professionally and deliver a quality service. Like farmer networks, these networks can vary from relatively informal interactions, to more highly organised opportunities such as the Australasia-Pacific Extension Network. 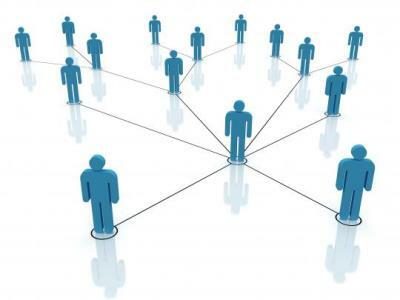 An emerging field in extension is online networking, which involves online network literacy. It relies on digital literacy, that deals with computer network knowledge and skills. It is also linked to computer literacy and information literacy. Network literacy relates to the basic knowledge and skills required for people to participate in online networks. This is the practice of using online communities and social media applications, to expand professional and social contacts and help build and maintain relationships. Why are networks so important in rural extension and for rural communities? 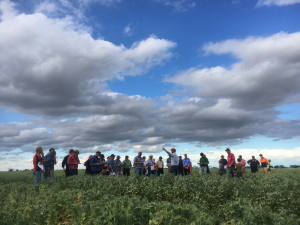 Data suggest that when farmers convene, new opportunities arise for increased economic viability, improved quality of life, and greater community interaction. The above diagram shows how Fleming et al (2014), demonstrated how relationships can be overlaid upon traditional extension models. 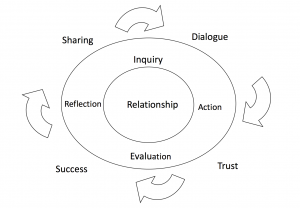 Developing an exact integrated model is not as important as having processes of reflection in respect to relationships and the acknowledgement of those relationships and the important role they play in implementing extension models. All networks rely on social interactions. Initial meet and greet opportunities and getting to know each other and making those early connections, are incredibly important. It’s great to identify shared interests and experiences and develop a shared focus early on. Extension professionals in particular, need to use active listening skills in developing effective network opportunities for themselves and their clients. Importantly, the initial focus must be on getting to know the right people and not having too many preconceptions or expectations. It is important to ask questions, listen and learn each other’s stories. Give to the relationship first – invest in the relationship and network to grow the value for all and then get the return. Building relationships and networks takes effort, commitment and time. Be authentic – make the building of connections sincere, meaningful and be patient as you and others get to know each other. Trust that people genuinely care about the well-being and success of each other, as this is important for the ongoing success of relationships and networks. People enjoy meeting interesting people and extending their networks, they will value meeting you and you introducing them to other useful contacts. People enjoy helping each other and being helped in return. This is particularly applicable to those involved in extension. As you build relationships and networks, acknowledge this and enjoy helping each other and make sure you note and celebrate success. Don’t hesitate to reach out to people that you think will be useful contacts. Make contact, learn what they are doing and offer assistance. This builds and strengthens your network and makes interactions mutually beneficial. Don’t be reluctant to ask for information, advice or assistance. In your interactions, have or develop a purpose. This increases the likelihood the network will be mutually beneficial for all involved. Set your potential reach and the geographic coverage of your network. Find “expert” champions and develop mutually beneficial associations. Look for opportunities to develop strategic alliances, that will deliver outcomes that meet each others needs. Planning is important, but make sure you take action that results in good outcomes for all. Ensure you have key influencers involved in any network. Follow up, do what you say you are going to and importantly thank people who help you. Meet face to face at least once per year, this is important for maintaining key relationships. Video meetings are much better at maintaining relationships than telephone contact. Be patient and master them. Important relationships benefit from at least monthly contact. Critical relationships benefit from weekly contact. Participation in networks won’t be and doesn’t have to be equal. In webinars or video meetings, you can’t speak over people. If you have an immediate comment or question. Use the chat box. In video meetings, turn your webcam on. Seeing people really adds value to the experience. Be aware of lighting and background. If you wouldn’t say it face to face, don’t write it online. Keep your reputation, and respect for others. Sometimes you have to be more patient online. Be forgiving and validate, it is easy to misinterpret text. Intense, contentious, sensitivities are involved or it’s very important? Visit, video call or pick up the phone. Online text is not good for these situations.